If you want to work as an engineer in the aircraft industry, this class is a must. Discuss different surfacing styles and techniques using air forms with plenty of examples. Work with curves from points. Learn to create and modify Conics, Spines, & Curves with respect to air forms. Learn to use critical math surfaces with confidence in this workshop. This workshop is only for designers, and engineers who have at least taken the One Week Surfacing Intensive. This class is intended to aid participants to master building critical air forms. Prior Creo surfacing with Creo surfacing and ISDX is necessary. No prior Aircraft experience is necessary. Lean to use Trajpar Variable to drive critical math using air form examples. Manage concavity and discuss terminology with examples in Creo surfacing that aircraft designers utilize with respect to bifurcation tubes and inlet ducts. Learn inherent issues and problems with 3 part boundaries. Discuss modeling technique for creating Nacelles and inlet areas for power plant. Learn to use critical math surfaces with confidence in this class. Learn to use the NACA aero foils generator for later import into Creo for wing developments. Create or manipulate a stealthy drone Creo model. Discuss various workflow for choosing a NACA wing section and importing that form into Creo for lofting wings. Discuss light reflections from a ground threat radar perspective. Lead a stealth surfacing lecture. Compare other surface modeling software utilities to Creo surfacing. 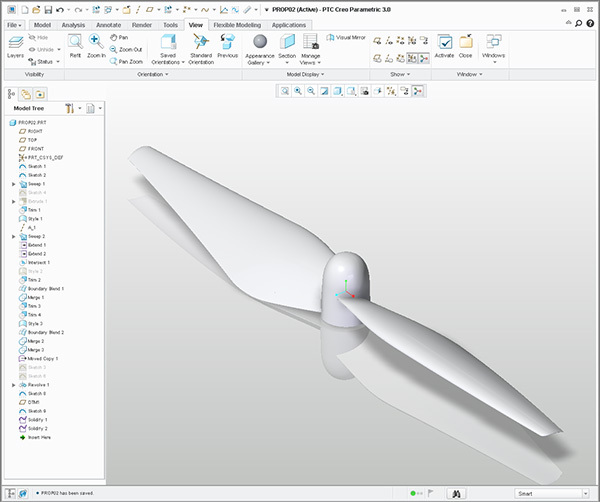 Discuss leading edge, angle of attack, relative wind, and cord length as related to modeling airfoils with Creo surfacing. Discuss proper technique for letting others to follow understand your approach to surface modeling. Discuss modifying other designers models. Discuss in detail techniques for avoiding 3 part boundaries and discover why expert surface modelers do not use 3 part boundaries (even masters of surfacing for reverse engineering). Discuss creating lofts between various cross sections with examples using air forms as examples.